Have you ever had an idea for a cool new toy, but wondered how you would ever be able to bring it to market? It seems daunting, and we won't lie - there's a lot of hard work involved. But the good news is that there are people all across the country that are bringing new specialty toys to store shelves every year. 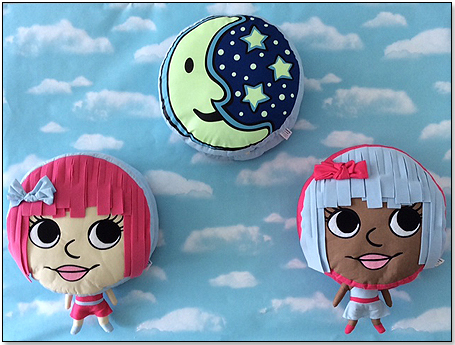 We reached out to Halie Fulton, president of MAF Industries, LLC and creator of the Dream Frenz, to learn more about the journey of bringing a toy to market. Below, she shares how she came up with her product, what it took to make her vision a reality, and how she hopes her toys will benefit kids. I never anticipated working with children’s products. In fact, nothing could have been further from my mind. I practiced law for nearly ten years before I got married. Since my husband and I were "older" when we got married, we decided to have a family right away. We have been blessed with three amazing daughters, now ages 8 to 14, and I have enjoyed being able to stay home with them. A couple of years ago, my daughters were in school during the day, and I was considering the next chapter of my life, when the inspiration for Dream Frenz® struck. I did not expect that my children would inspire a new career path, but the imagination of a child is so free of boundaries and borders that it opens your mind to new possibilities. You hear so much about Moms that become entrepreneurs, and you hear about baby boomers that start second careers. I fit both categories. I am now pursuing a dream that I never even knew I that I had. Q. What aspect of the toy industry most surprised you when you first started? Well, I am just getting started, and I am learning something new every day. I have had a few opportunities to hear toy industry veterans speak. I love to learn from history and the voices of experience. It is interesting and surprising to learn the history behind some of the classic toys. It is not easy to develop a new product and a new business, but every small success feels huge. So, I am finding it very rewarding. Seeing Dream Frenz in a store window display for the first time was amazing. Considering the time of year, I have to say that it is an absolute thrill to think about a young boy or girl getting Dream Frenz under the Christmas Tree. We have launched Dream Frenz with an initial collection of ten characters. These characters began life as crayon drawings by my oldest daughter, when she was 6 or 7. When she was little, my daughter loved to draw characters with big heads and tiny bodies She would use wonderful color combinations, and she would draw all sorts of characters. Who knew that the sun, the moon or a star had a body? She would draw on the back of paper restaurant placemats, instead of doing the games on the front. The inspiration struck one day at lunch. After several years of watching her draw these characters, I suddenly had the idea that the big heads should be round pillows and the tiny bodies could tuck inside. 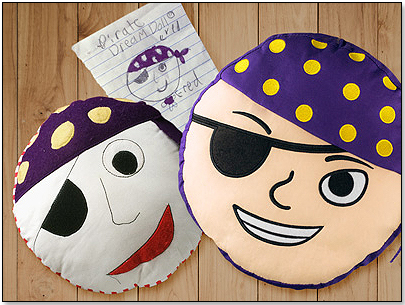 This picture shows the original picture, the prototype and the finished product of PJ the pirate. Since I have a background in law, the first thing that I did was pursue protection for the intellectual property. We have a utility patent and two registered trademarks. We had to produce a prototype, and luckily my middle daughter was taking sewing lessons with a talented lady who could sew anything! This was very lucky because I can't even sew on a button. I had to find a manufacturer, and I worked with an artist to get the images just right. Once I found a manufacturer, it took a lot of emails back and forth to get the product like we wanted. It took about two years from the day the idea struck until we actually held the product in our hands. Q. What were the top two or three most significant obstacles you had to overcome to achieve success, and how did you do it? As I mentioned, every small success feels like a huge victory. It was very difficult to get quality factory samples that looked exactly like the artwork. It took a lot of time and effort to get the samples just right. Once we worked our way through this difficult process of emailing pictures of every detail, and shipping the final samples for personal inspection, we were very happy to be through the initial design phase. That happiness was short lived when we placed a production order, only to find that some of the fabrics were no longer available. We had to pick a number of the fabrics over again. Q. What is the most disappointing thing that you have to live with as a business owner? I am disappointed that it is so expensive to manufacture products in the United States. When I researched manufacturing options, I realized that I was unable to produce a product in the U.S. at a viable price point. I still hope that at some point, we can overcome that obstacle, and produce at least some of our products in the U.S.A.
Q. If you had to start over, what would you do differently? I think it is too early to know what I would do differently. Only time will tell. Q. What were the top two or three best pieces of advice you received and from who? I have to say that one piece of advice that I find inspirational was written by Nik Wallenda. I took my girls to see a performance where Nik and his family performed their famous high wire act. After the performance, the Wallendas graciously signed autographs for anyone who wanted one. Needless to say, there was a long line. My girls got posters that showed Nik Wallenda as a speck on a wire over Niagra Falls. He wrote on the poster, "Never give up." This reminds me that you must persevere against all sorts of circumstances to reach your goals ad make your dreams come true. Another thing that has stuck with me was hearing the President of Ringling College of Art and Design, Dr. Larry Thompson, speak at a luncheon that I attended. He stated that "creativity will fuel the economic future of our country". I completely believe that is true, and it is very exciting to bring an idea to life. My greatest accomplishment is simple. I am most proud of giving my girls an example of how a creative idea that began in their imagination could become a product that they can hold in their hands. Q. What unique quality makes your product better than your competition? Dream Frenz are like the personification of your imaginary childhood friend. 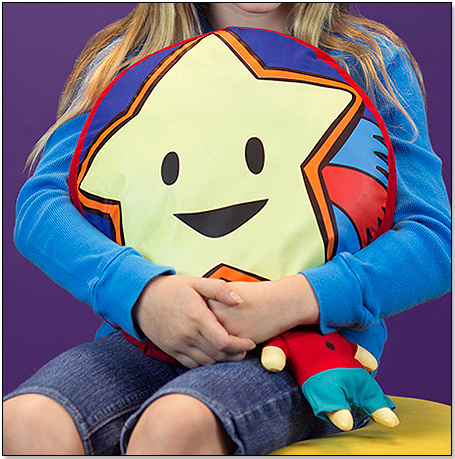 They are unique pillows that turn into cuddly friends by simply extending the small stuffed body that tucks inside. The Dream Frenz design is unique and we were granted a utility patent thereon. They are the perfect size to hold and hug. They group together well for imaginative play options, and they appeal to a wide range of ages of both boys and girls. Dream Frenz are functional, whimsical and fun. There aren't many toys that appeal to that wide of a market. Q. How do you hope your products will affect children's lives? The primary purpose of the Dream Frenz product is to put a smile on a child’s face and provide a comforting friend. As a friend to dream with, we hope that Dream Frenz will spark a child's imagination and encourage them to Be A Dreamer®. Q. What does your company have planned for 2015? We are looking forward to adding some new friendly faces to the Dream Frenz collection. Pretty Pink Penelope and Beautiful Blue Brittany (shown with bodies tucked in) make delightful friends! Ruggedly handsome, PJ the Pirate with Merry the Mermaid, and Sol the Sun (shown with body tucked in).